Even the most studious, responsible teen has to kick back once in a while, but that doesn’t have to mean a lot of mayhem and murder. Here are some games (and gaming add-ons) that’ll keep them entertained without undoing all those years of careful parenting. Not every kid gets the latest, greatest computer hardware. Some have to suffer with hand-me-down Macs. If that’s the case in your house, check out Spiderweb Software ’s $28 Geneforge 4: Rebellion. It’s a classic Dungeons & Dragons–style, turn-based role-playing game that—amazingly—is downward-compatible straight to Mac OS 8.1. It also runs natively on Mac OS X, and it works well in Rosetta on Intel Macs. If your kid has a Sony PlayStation Portable (PSP), here’s a way to make it at least a little useful. With Mark/Space ’s $30 The Missing Sync for PSP and a USB cable, you can turn that PSP into a full-fledged PDA, using OS X’s Sync Services to put Address Book contacts and iCal appointments (with notes) on the PSP’s memory card as Web pages, which you can then view with the PSP’s built-in Web browser. It’ll also convert and transfer movies to the PSP, copy iTunes playlists (unprotected music only, of course), sync iPhoto albums, and back up game files. The latest add-on for the enormously popular simulation game will take it in an entrepreneurial direction. 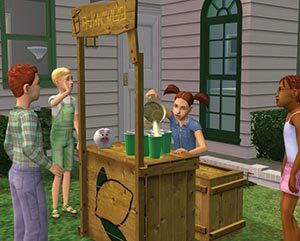 When you add the Open for Business expansion pack to The Sims 2 ( ), you can help your sim get a job and build a business. At press time, Aspyr said that Open for Business should be shipping by the time you read this. Feral Interactive ’s Black & White 2 has been a long time coming, but it’ll be worth the wait. Announced last fall and (at press time) expected to be released any minute now, the game lets you take on the role of a god who thrives on the worship of people, using giant animals to do your will on earth. You can either rule with an iron fist, drawing power from terror and fear, or be a gentle and benevolent god, drawing energy from your believers’ love and affection. The one thing you certainly can’t do is ignore them, however—because they’ll ignore you, and for a god, that’s not good.